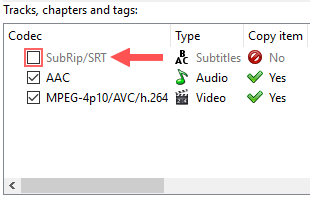 This tutorial will show you step by step how to easily and quickly remove hardcoded subtitles from MKV video files without cropping and converting. (Hardcoded subtitles are embedded in the video/movie). 2. Click on the + Add source files button located at the bottom. 3. Go to the .mkv video file located on your computer. 6. In the Tracks, chapters and tags panel, you uncheck (deselect) subtitles. Note: Do not uncheck (deselect) the video and audio. 7. At Destination file located below the Tracks, chapters and tags panel, you can view and change the location on your computer where MKVToolNix will save the new MKV video file. MKVToolNix will now create a new MKV video file, but without the hardcoded (embedded) subtitles. This process is fast because it doesn't convert the video. It only creates a new video file without subtitles.